Originally commissioned by friends of the National Shrine of the Little Flower in Royal Oak Michigan. 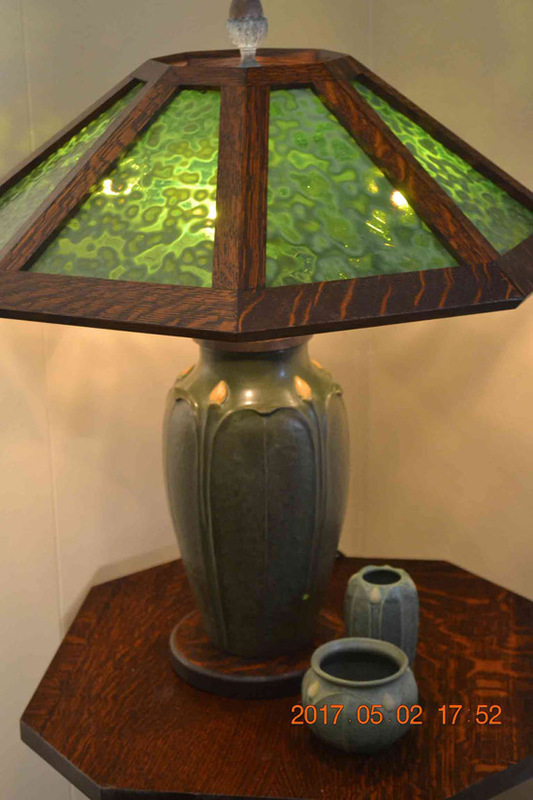 The classic Grueby green lamp base, is crafted by Kevin Mills, of Ephraim Pottery in Lake Mills Wisconsin. Each porcelain base is hand thrown on the potter's wheel and then sculpted with repetitive leaf and floral patterns. The entire lamp height is 23 inches, and width is 21.5 inches. There are no pull chains because this is a 3-way touch lamp operated by simply touching the solid brass acorn finial. There are 4 candelabra bulbs with a max incandescent brightness of 40 watts each. The 12 panel quarter sawn oak lamp shade will accommodate mica or stained glass. The solid quarter sawn oak base is 7 inches in diameter and 1 inch thick.